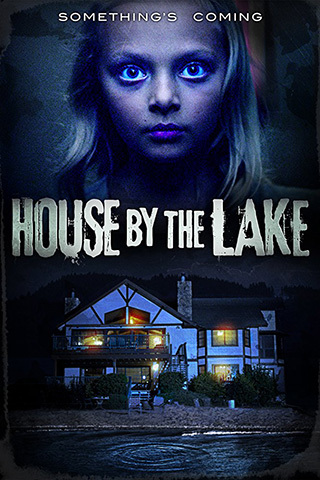 House by the Lake follows a family of three — mother Karen (Anne Dudek, “The Flash” TV series), father Scott (James Callis, “The Hollow”), and daughter Emma (Amiah Miller, “War for the Planet of the Apes”) — through an extremely tumultuous time in their lives. After having learned that Emma, who has strong aversions to water and being touched in addition to being plagued by sleepwalking and nightmares, might be autistic, the trio has retreated to her paternal grandparents’ lake house in Southern California in an attempt to relax and work on their relationships. Armed with information from a psychiatrist (Lee Garlington, “The Angriest Man in Brooklyn”) who appears to treat Karen as well as Emma and having hired a nanny named Gwen (Natasha Bassett, “Hail, Caesar!”) to work with Emma while her parents work on their marriage, Karen and Scott seem cautiously optimistic and willing to put in as much work as is needed for a successful retreat. Once their trip begins, however, a combination of marital strife, Emma’s behavior and Gwen’s licentiousness in addressing it, and the unexpected intrusion of local creep Harry (Michael Bowen, “Django Unchained”) and the Fishman, a mysterious lake monster he claims to know, set off a number of fatally disruptive ripples in the family’s prospective calm. With Emma becoming more, rather than less, distant from her parents and Karen’s insecurities undermining her relationships with both Scott and Gwen, it is clear that Harry’s fabled Fishman isn’t the only thing lurking below the surface that will test and question the family’s love. One plot hole in House by the Lake that I simply could not get past, as much as I genuinely enjoyed the film, was Karen and Scott’s reaction, or rather lack thereof, to Emma’s troublesome wanderings at night. In her sleep, Emma hides in closets, turns on faucets, and even disappears from the house all together, sometimes long enough for local authorities (Mark Berry and Guy Nardulli) to get involved. Still, though much drama is derived from multiple frantic search sequences, Karen, Scott, and Gwen do virtually nothing to make it so Emma’s somnambulance is curtailed. Every night the three adults put Emma to bed, and almost every morning they look desperately to discover where she’s ended up, without so much as locking or even putting a bell on her door. Gwen even sleeps in the same room as the young girl in her charge without waking as she leaves. Though on at least one occasion Gwen apologizes to Emma’s parents for her own deeper sleep, neither she nor Emma are ever shown to face any disciplinary action whatsoever after the child is found. This ruins the sleepwalking as a source of tension; one can only see Emma wander around at night so many times without any of the adults around her even attempting to prevent it before one loses the ability to empathize. What works exceptionally well though, is the dynamic between Karen and Scott, due both to Emma’s diagnosis and their cohabitation with the young, beautiful Gwen. Karen is every bit the anxious wife who worries she cannot parent her own daughter or keep her marriage from falling apart, and Scott the loving father and husband who, more than dealing with his family’s issues, really just wishes for them to go away. The banter between the two, both when flirting and when fighting, is realistic and endearing. We both chuckle when their plans to become intimate are interrupted and cheer on one or both sides of their many, very well written fights. It is easy to interpret House by the Lake metaphorically; to see the Fishman only appearing to Emma and prowling the bottom of the lake as a manifestation of Emma’s murky, inaccessible inner world, threatening to pull her underneath it and away from her family forever. Whether such a concept is inherently offensive to the autistic community or more of a condemnation of Karen and Scott’s inability to cope with Emma’s neuroatypicality in a productive way is, unfortunately, ultimately unclear. What it is, regardless, however, is an exploration of the consequences of not dealing with issues clearly and above water the moment they arise, and a tension filled drama about a family desperately attempting, and not really succeeding, to stay afloat.